Last week, we had WAAAYYYY too much fruit in the house! My 18-year-old daughter Abby was in charge of grocery shopping while I was out of town, and she bought more strawberries than we could ever eat. 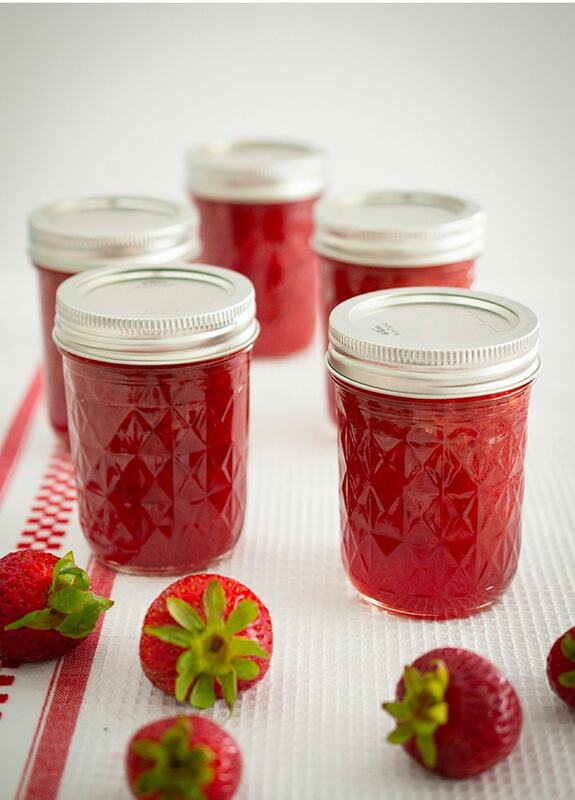 In a way, it was a great problem to have, because it gave me a chance to make my favorite low sugar strawberry jam. Before we get to the jam, I want to tell you why I was out of town. I went to Des Moines for a week, because my oldest daughter Allie, my FoodLove blogging partner who lives in Iowa, HAD A BABY! This little bundle of joy was born July 3. 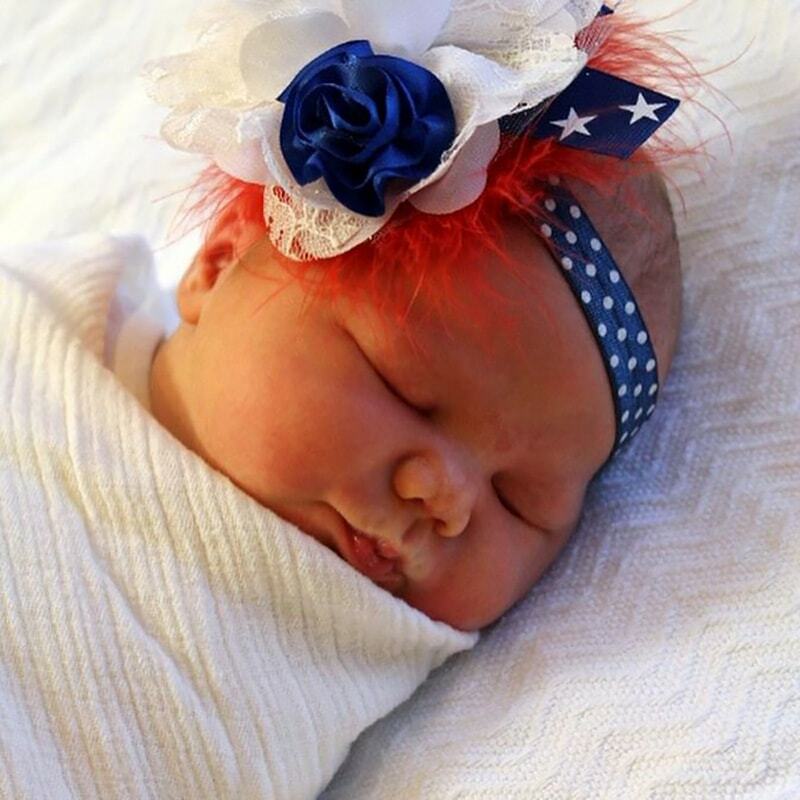 Isn’t she a darling little firecracker? Actually, calling her a firecracker is not accurate at all, because she’s the sweetest, calmest little thing you can imagine! Congrats Allie! Cutest. Baby. Ever. You can easily find the jars, rings, canners and all the equipment at stores like Walmart or many grocery stores, or you can order a canning kit, like this Ball Enamel Water Bath Canner with Utensils , from Amazon. Most people only have to buy this equipment once, and it lasts a lifetime. The one exception is the jar lids and rings, which have to be replaced. Before you begin, sterilize 6 half-pint Mason jars. You can do this using the sterilize cycle of the dishwasher, or by boiling the jars on the stovetop for 10 minutes. I usually fill the canner with water, and use that to boil the jars. Use the jar lifting tongs to take the jars out of the water, and set the jars on a clean kitchen towel. Put 2 small ceramic plates in the fridge, because you will need those later for testing the jam. Meanwhile, wash and hull about 8 cups of fresh strawberries. Eight cups of fresh strawberries should yield 5 cups of mashed strawberries, which is what you need for this recipe. Obviously, the better tasting fruit you have, the better your jam will turn out. Even if your fruit is just okay and not amazing, though, the jam-making process adds a lot of flavor. Cut the strawberries in half, put them in a big mixing bowl, and mash them with a potato masher. I like to use a large Pyrex measuring bowl, because I can see how much mashed fruit I have. Mash them up as fine as you want. I mash them a lot because I don’t like big chunks of fruit in my jam. A key ingredient to low sugar jam is low sugar pectin. You can usually find this in grocery stores near where the canning supplies are. Make sure you get the low sugar pectin and not the regular. Pectin helps the jam thicken. 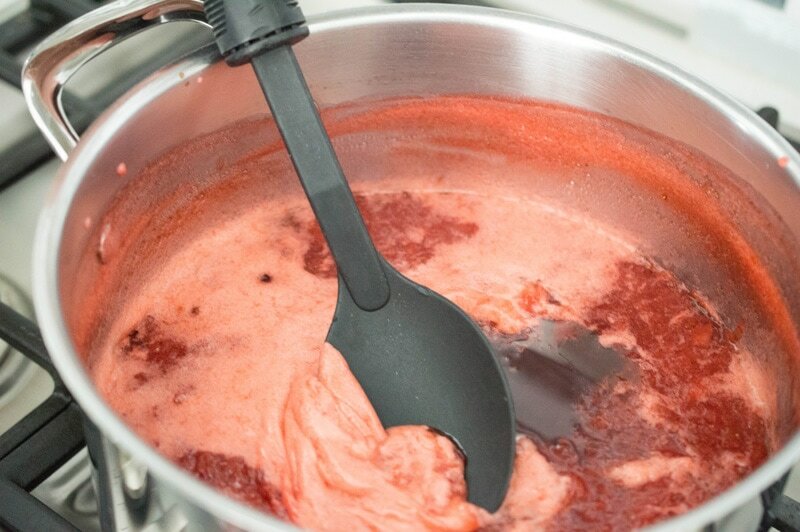 You can make strawberry jam without pectin, but you have to cook it a lot longer. It also turns out kind of brown and runny. I’ve made strawberry jam without pectin before, but I didn’t love it. Pectin is made from apples, so you don’t need to worry that you’re adding artificial chemicals to your jam. This recipe simply calls for fruit, sugar, lemon juice and pectin. First, you’ll mix the fruit, lemon juice, pectin and 1/4 cup of sugar in the pot, and bring that to a full boil. Then you’ll add the rest of the sugar to total 3 1/2 cups, and bring it back to a full boil for one minute. Keep stirring the whole time so it doesn’t burn. Yes, 3 1/2 cups of sugar is a low sugar jam recipe! 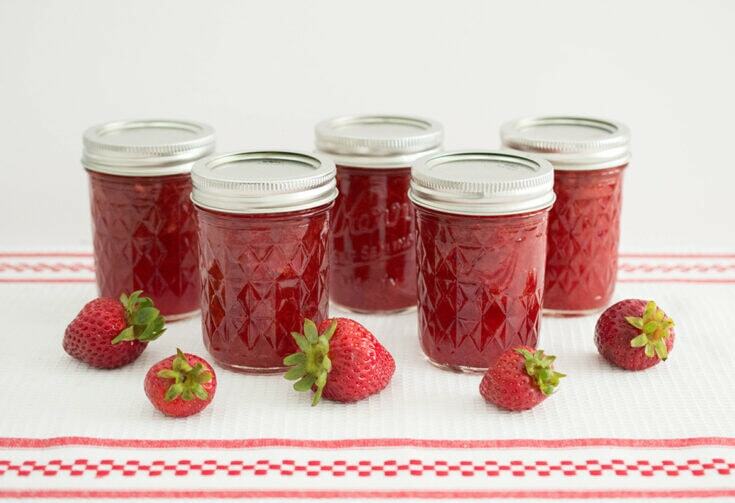 A regular jam recipe would call for 7 cups of sugar! Regular jam is more sugar than fruit. The way I look at low sugar strawberry jam is that it’s a lot of sugar per recipe, but not per serving. It has so much flavor that you’re not going to eat a lot at once. You might notice that this recipe calls for less fruit than recipes written by the companies that sell pectin. I use a ratio of fruit to pectin that makes a relatively thick jam, which is what I like. This jam has a spreadable rather than a pourable consistency. If it’s still too runny, boil it for another 2 minutes and test again. If it’s too runny after that, you might need to add another 1/4 box of pectin and boil again. (I’ve actually never had to do that.) This batch was perfect after the first test. 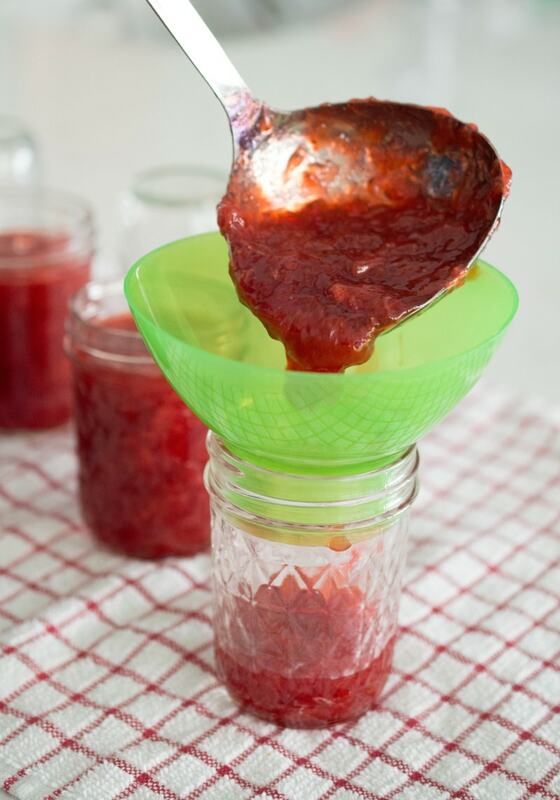 Fill the jam jars using a ladle and canning funnel. Make sure to leave about 1/4 inch of “headspace,” or empty space, at the top of the jar, so if the food expands during processing, the lid does not blow off! Wipe off the rims of the jars with a clean towel. Place the lids on the jars and secure with rings, but do not screw the rings on too tight. 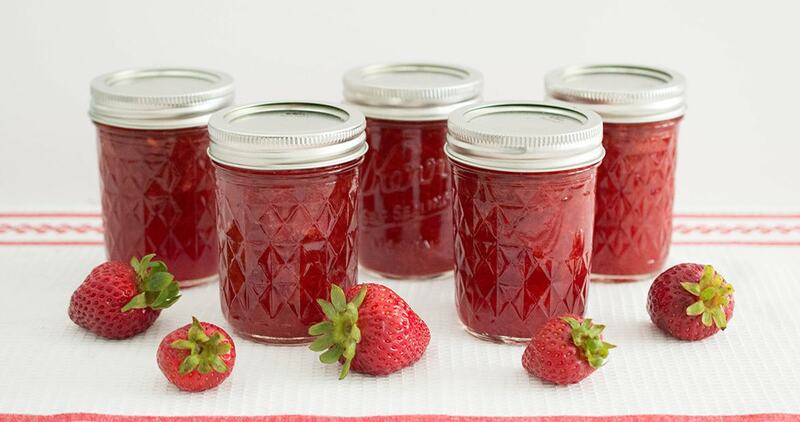 It's easier than you think to make your own fresh low-sugar strawberry jam! Preserve the beautiful flavor of summer berries with this simple recipe. 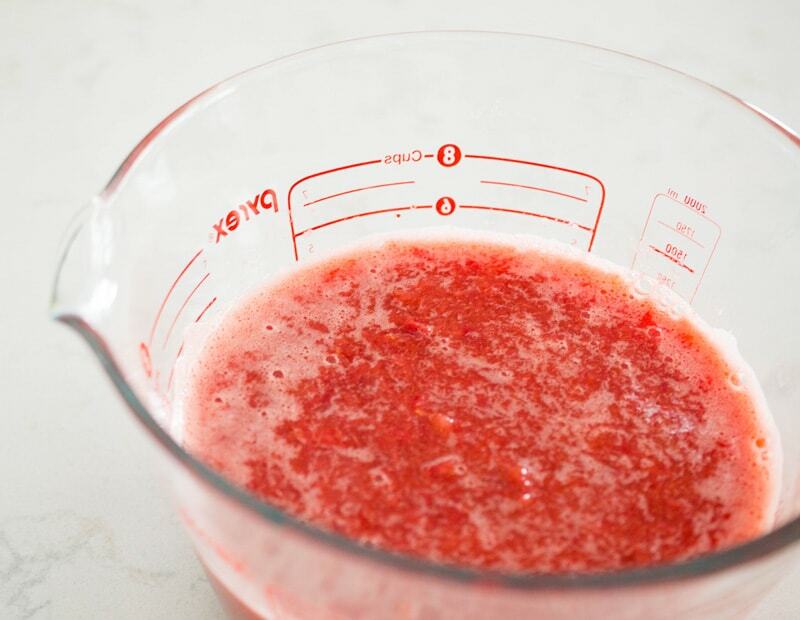 8 cups whole raw strawberries, to yield 5 cups mashed strawberries. Wash and hull the strawberries. Mash them with a potato masher. You can decide how fine or how chunky you want them. Measure the sugar, and reserve ¼ cup to mix with the pectin. 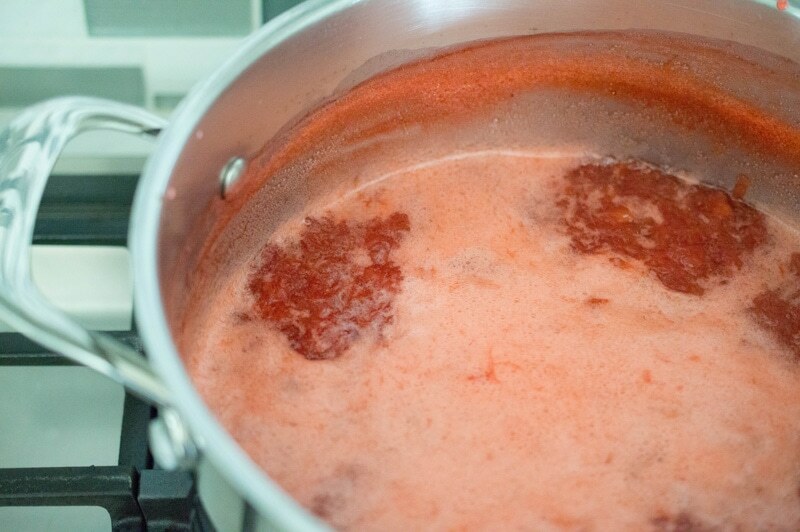 Place the strawberries in a large cooking pot, and add the pectin mixture. Over medium high heat, bring everything to a full boil that does not go down when stirred. Stir the entire time so the jam does not burn. At this point, add the rest of the sugar, stir well, and bring the jam back to a full boil for one minute. 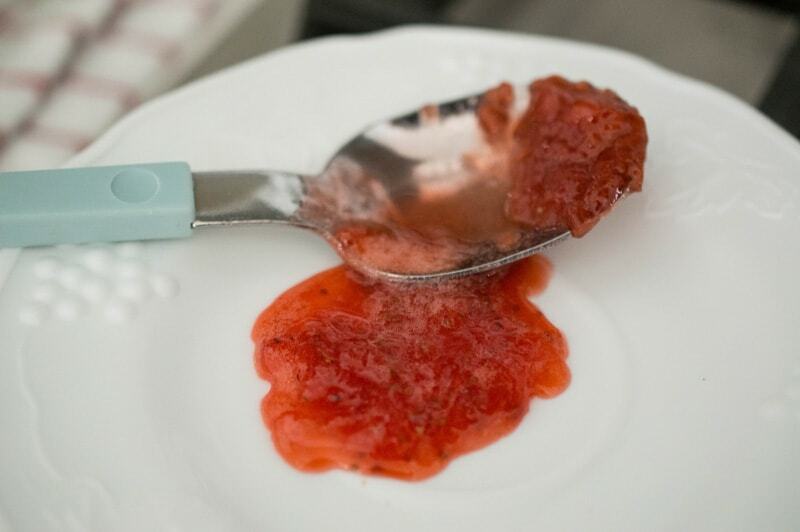 Turn off the heat and test the thickness of the jam by putting a small spoonful on a cold ceramic plate. If it’s thick enough, it’s done. If it’s too runny, add ¼ package more pectin, bring to a hard boil again for 1 minute, and test again with the second cold plate. Congratulations on the baby and thank you for such a wonderful recipe. I made it yesterday and it’s exceptional. Quick, easy, and very very tasty. I used two packages of 2 1-pound boxes of strawberries and they yielded 6.5 half-pint jars.